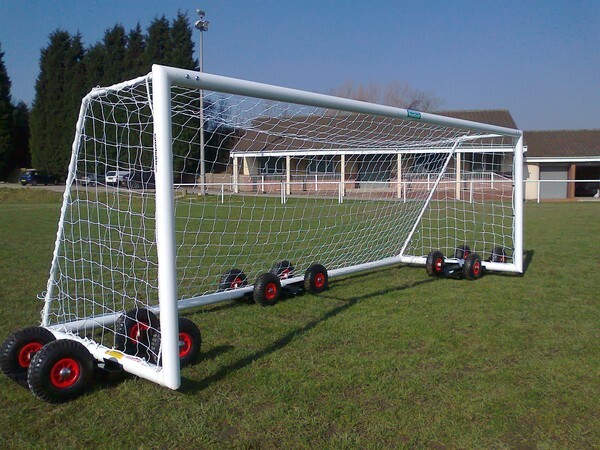 If you have numerous freestanding goalposts to move around, dollies can save thousands of pounds, the same time protect the playing surface and do the job better. 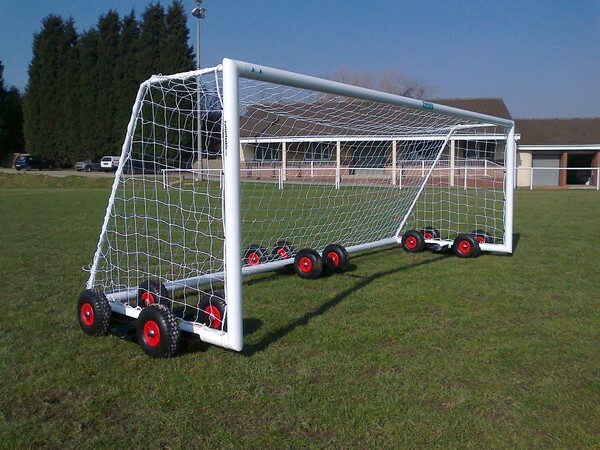 The unique design allows goals to be moved in all directions.These are particularly useful in stadiums with short run backs to crowd barriers as they allow the goal to move sideways along the side of the pitch unlike fixed wheeled goal posts which can only be moved backwards and forwards. The two photographs show the goal frame positioned on the dollies for moving in both directions. We also have folding goals with wheel transporters for more difficult access. - shown on "moving the goalposts " . By using two or three dollies the weight of the goal is spread evenly over the whole surface area of the goal frame making moving of any goal easy. The dollies spread the load across four wheels and thus eliminates the possibility of damage to the playing surface. Numerous freestanding goalposts have flip over wheels on each corner and these do not perform well as they collapse inwards and become entangled with net cord.This type of wheel has a short lifespan due to the fact that they are in the main left outdoors which ceases up the bearings. Dollies do the job better, they offer longevity, practicality and offer real value for money compared to the alternative fixed wheel options. Now the wheels use the very latest non puncture tyres so no maintenance on tyres.